This is all the work of F. Dorenberg, N4SPP. Thanks OM! replacement for those who are tiring of Morse code. Its perfect for Knack victims. We can even build mechanical printers. Thanks Bob! After watching all Pete's work with the smaller Arduinos, that Uno R3 board seems HUGE. That's what I should stick with. Great idea using those robust terminal strips. Thanks Pete. 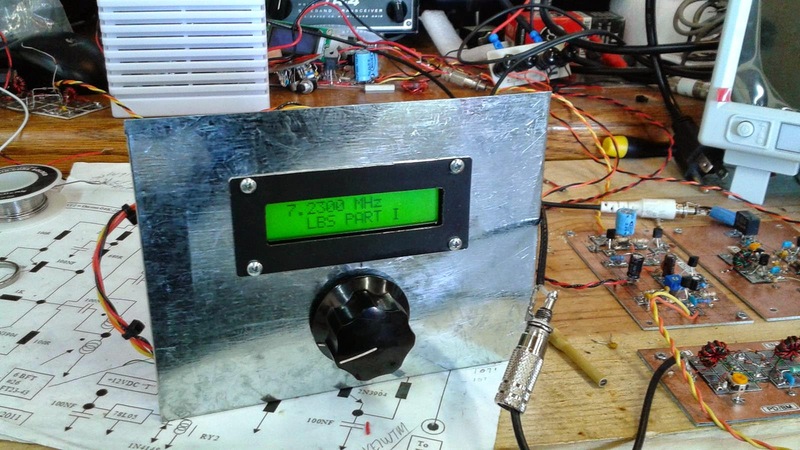 This direct conversion receiver is part of the "Let's Build Something" project of Pete N6QW and Ben KK6FUT. Publication will be in QRP Quarterly late in January 2015. Pete reports that the front panel is a piece of galvanized sheet metal from Home Depot –total cost 82 cents. We did it AGAIN! 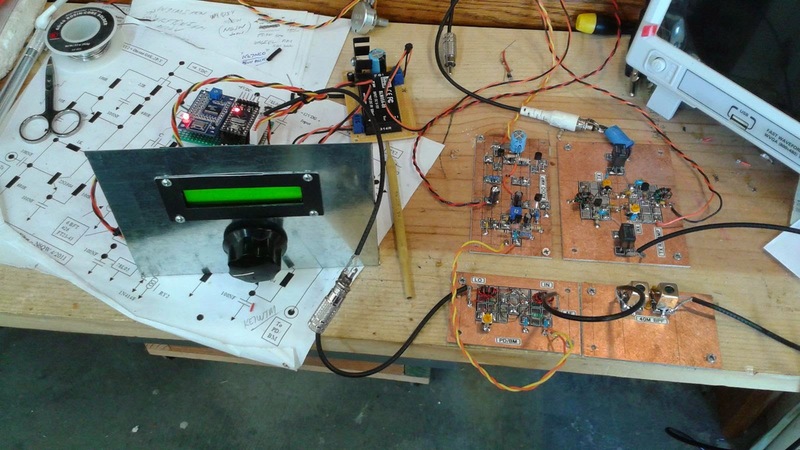 Winners in the Homebrew Double-Sideband QRP Northern Virginia Category! Sweet! I can't wait to pick up the trophy! 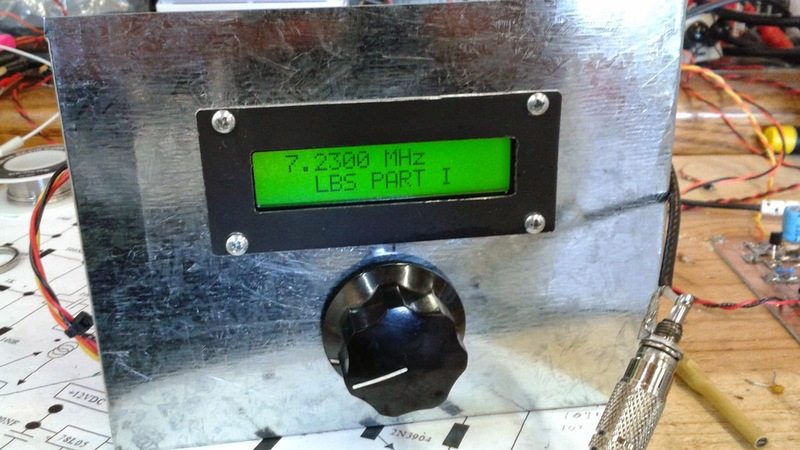 Back in March 2013 we ran a blog post linking to a video of a beautiful superhet receiver built by Lee Snook, W1DN (that's his shop). Then the video disappeared. Today Peter Parker, VK3YE, alerted us to the reappearance of the video. Some Googling led me to Lee's YouTube channel and many other videos of some truly amazing homebrew projects. That's an awe-inspiring "selfie"! This looks like something out of Kubrick's "2001 -- A Space Odyssey." Congratulations to the European Space Agency! Using the CIVA camera on Rosetta’s Philae lander, the spacecraft have snapped a ‘selfie’ at comet 67P/Churyumov–Gerasimenko. 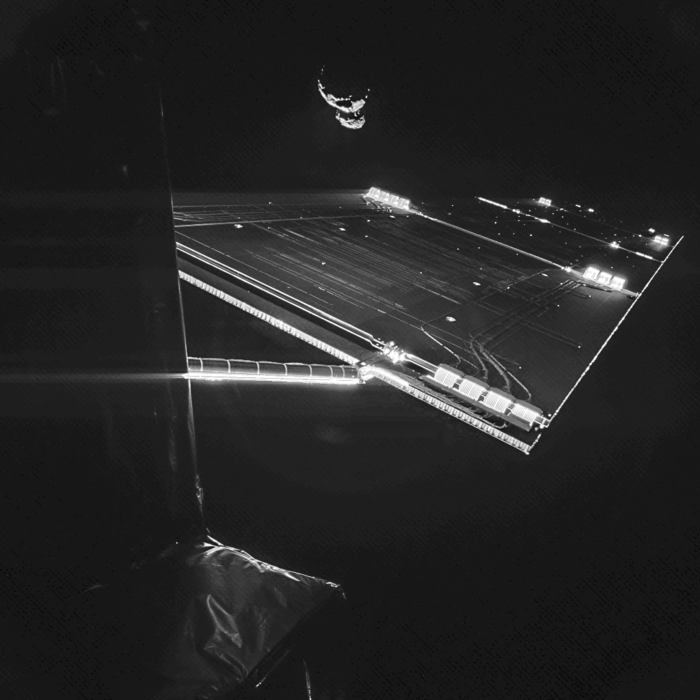 The image was taken on 7 September from a distance of about 50 km from the comet, and captures the side of the Rosetta spacecraft and one of Rosetta’s 14 m-long solar wings, with 67P/C-G in the background. Two images with different exposure times were combined to bring out the faint details in this very high contrast situation. 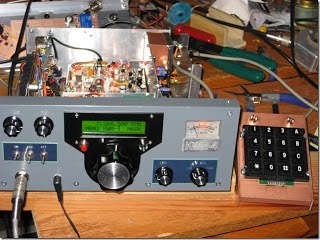 With advice and tribal knowledge from N6QW and MeSquares from W1REX, Colin M1BUU, is making excellent progress on his BITX. I see that he has some territory on the board reserved for a DDS VFO. That's fine, but here's and idea for Colin and other builders: Why not build it with the standard VFO first and then add the DDS or Si570 VFO later, perhaps as an external accessory? 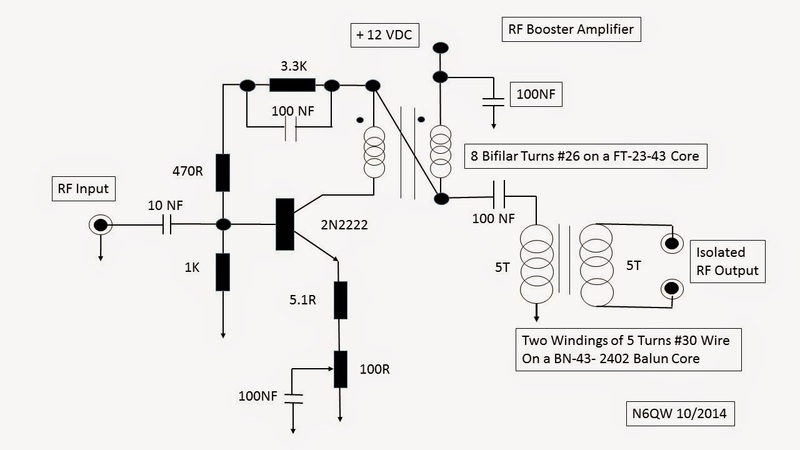 That way you get the experience of building an LC VFO -- the full BITX experience. Yea, it is hard to imagine Paul M0XPD as a newcomer to the hobby such a short time ago -- he is definitely now in the ranks of the esteemed digital Elmers. And yes Colin, we do hope you avoid unwanted oscillations. Because of Farhan's great design you have a good shot at avoiding this plague. But be prepared OM. It happens to the best of us. A lot. Stiff upper lip! Never give in! I enjoyed your video about your Arduino experiment. You bet me to it! I'm really looking forward to getting my version of an Arduino powered BITX up and running. 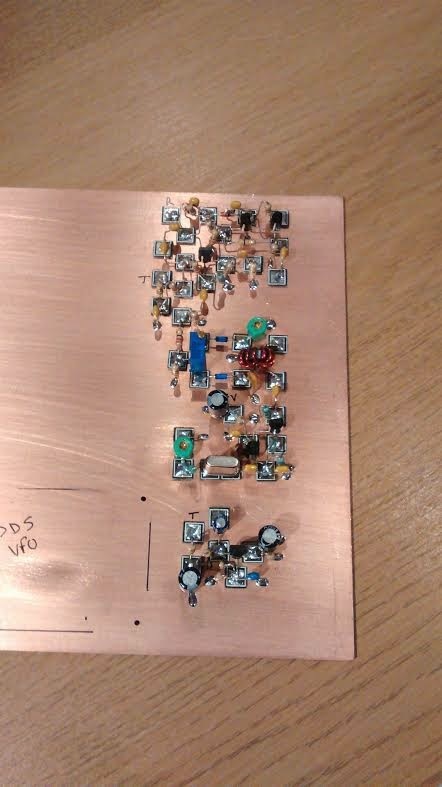 Steady progress is being made, yesterday I added my first bidirectional amplifier to the build. 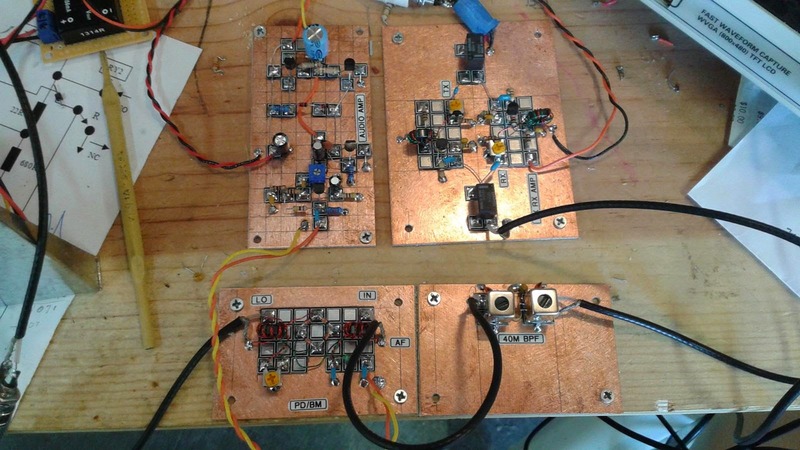 I now have the mic amp, BFO, balanced modulator and first amp completed. I tested the BFO on it's own and got a respectable looking signal out of it and with a good swing below 10MHz. Next I need to add the crystal filter, second IF amp and mixer. Pete's video will help for the mixer! BTW, I'm using the ver3 schematic but I intend to use the ver1 band pass filter. I set out building the circuit following the N2CQR layout diagram but I've already run short on space! I do have a good excuse though, my board is smaller than yours (10"x6"). Despite my best intentions, I'm falling back towards old habits of making my circuits physically small. I'm using MeSquares in order to try and force myself to space things out a bit. I do hope that I don't end up with any unwanted coupling! I must try hard to leave lots of space between the next bits of circuit. 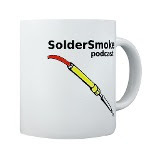 I was listening to SolderSmoke 104 today and Paul M0XPD was introduced as a new ham. Little did we know that Paul would become such a big player! I couldn't resist posting this picture of the vehicle used by Budd, W3FF. 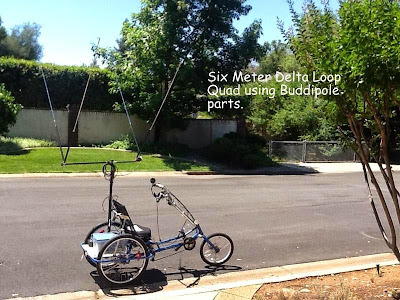 I talked to him yesterday on 17 meters -- transcontinental -- as he pedaled home in California on his magnificent trike. He wasn't using the quad in the picture (he was on a vertical). The six meter quad is fantastic. He worked Japan with this rig on six. He has a trike trailer that carries his linear amplifier. You might find that once you plug that DDS into a circuit you may not quite get 1 V pk to pk and in fact after about 10 MHz it really starts to sag. 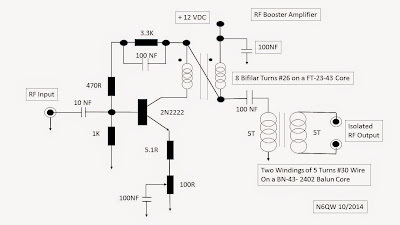 See the attached drawing as you can put this “afterburner’ on the output of the DDS. The isolated output is good if you are interfacing with “toob” type equipment –it can be left off if you are doing SS or just left in place. This is the output from the amp and as you can see fairly clean. This is only temporary! My analog, discrete, hardware-defined BITX17 was NOT harmed or even modified for this little experiment. I somehow missed this one. 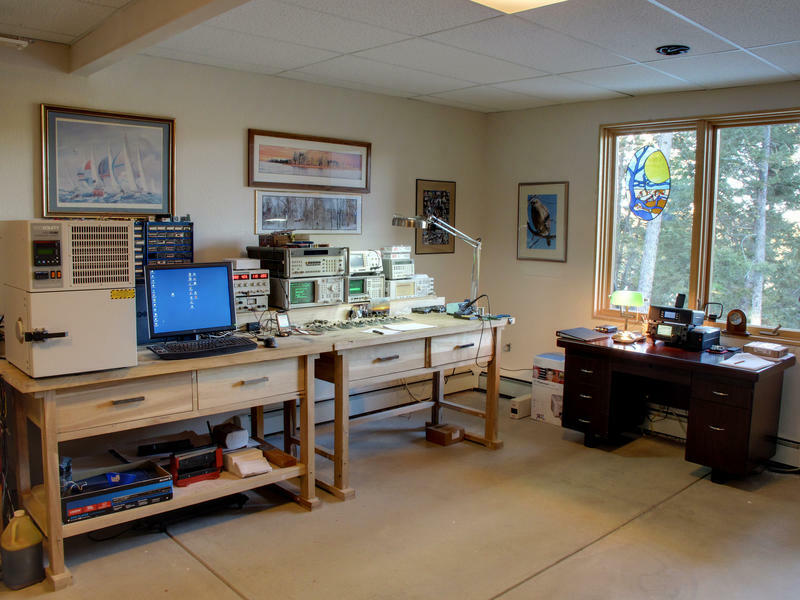 Here Pete talks about how the use of the Si5351 in ham radio has been evolving, who has been working on it, etc. 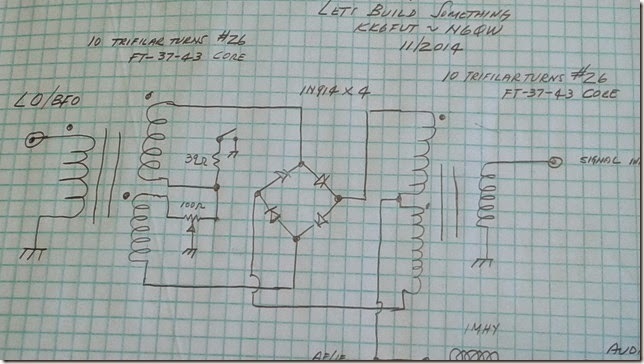 Congrats to Pete for his amazingly fast development of a 40 meter superhet receiver using a single Adafruit Si5351 paired with an Arduino Nano for ALL of the frequency generation. No more VFOs, no more crystals. It sounds great! Amazing stuff. 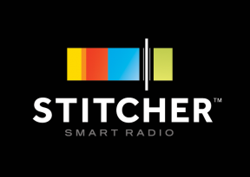 I wanted to forward to you a slightly edited email I sent to one of our podcast listener’s as I think this is a really good example of some “Tribal Knowledge”. 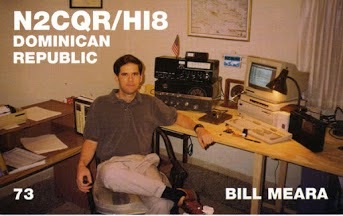 Ham radio publications are much like the Internet –all that is published must be scrutinized. 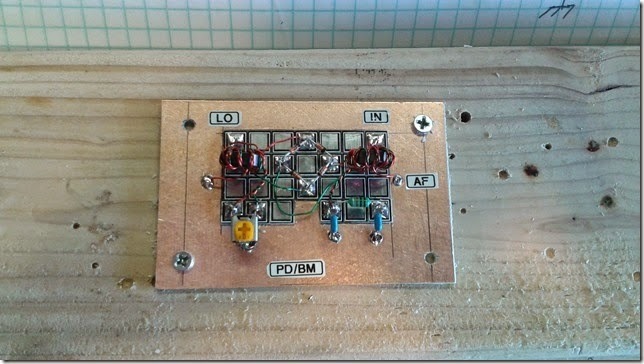 One such publication had a beautiful QRP to QRO amp using a 3CX800A7. A few watts in and 800 Watts out. 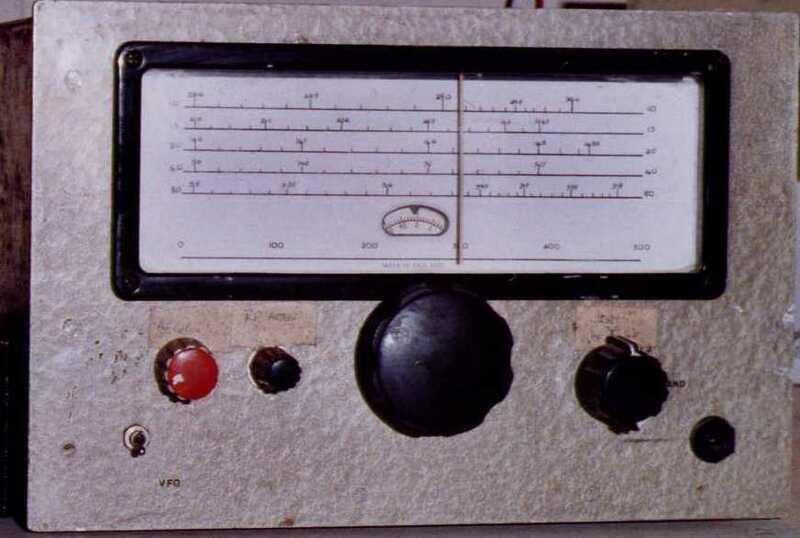 My daughter was in FM radio broadcasting and I told her to introduce herself to the station engineer and to look out for any pulls – then the floodgates opened –about a week later I had a 3CX800A7. So I started to work on the amp. The circuits just didn’t make sense and parts were missing that would make it work correctly. 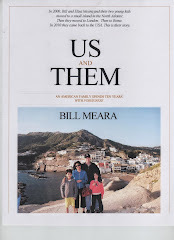 I contacted the author and here is what he shared. He built the amp but never did get to proof the final article. In fact he sent me his notes and sketches which were correct. Thus I could have never built that amp using just the article. I built it for one band, 20 Meters. It has a tuned input and a Pi-L output so is quite excellent on harmonic reduction. Oh BTW this amp caused me to learn about PIC Microcontrollers. You cannot hit the 3CX800A7 with HV voltage until the cathode is warmed up (must be a female tube). That time delay is 3 minutes. I could not find a suitable time delay relay with a 3 minute delay that didn’t cost an arm and a leg. So that is when I thought about using the PIC16F84 as a time delay relay. Later I ported that over to a 12F675. The cost was less than $10. In the 3CX1500A7 amp ( another free tube) I have two microcontrollers in there. One is used for a three second step start on the filaments (don’t want to shock the filaments with inrush current) and the second for the 3 minute delay before starting the HV step start sequence. You can see the “Big AMP” on my website at http://www.jessystems.com. There was only one problem – I was worried about the cooling of the tube so I made sure there was plenty of air which I dump into a very small sub-chassis and the exhaust is out through the tube. Well “Dah” large volume in and small port for exhaust and you have a jet engine sitting on the desk top. Man it was loud – I would wear headphones when it was working. When I built the 3CX1500A7 amp I used a larger plenum so not as loud. 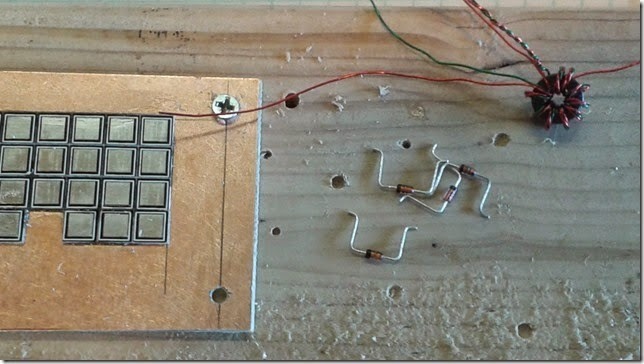 Turn off the soldering iron and spend a good deal of time “noodling” over the circuit so that it is clear what each function will do and that all the wires connect to something. Contact the author and ask lots of questions and you might be surprised to find out the published design is not what was designed! Look for uncommon solutions to build problems. Many times parts used in the articles are so unique that only one exists in the whole world and it is installed in the authors unit. In the Big AMP I figured out how to keep the blower going for about 1 minute after the amp is turned off to “cool down” the tube. The point here is to think about not just the amp itself but refinements to make that $600 tube last for a very long time thus filament current inrush protection and tube cool down. Don’t forget SAFETY – there is 2000 Volts @ 1 amp running around chassis–it is an electric chair sitting on your desk top. I included a microswitch that when the top cover is off it de-energizes the HV circuits. See if you can spot it in the photos. PS The amp really does exist –see below. I love it when a new rig is spread out on the workbench like this, pulling in its first signals. Like First Light on on a new telescope. These are the same boards you have been seeing in Pete's previous videos: The Si board, the mixer, and the AF amp. Now they are linked together in the form of a Direct Conversion receiver. Who needs LM386 ICs? Pete goes discrete! Love the MePads. And I knew Pete was going to test it with his finger! He's just taking stray hum from the power lines and coupling it to the input through that Exacto knife. Seems to me like these boards is getting close to actually receiving signals. Just finished building the PD/BM that will be used in the final circuit of the LBS Part I. I will also upload a video of the build. The W1REX MeSquares really work very well and greatly facilitate the build. So the newbie builder -- will have one leg up by using the squares method. Pete's video on this circuit appears below -- just scroll down a few. 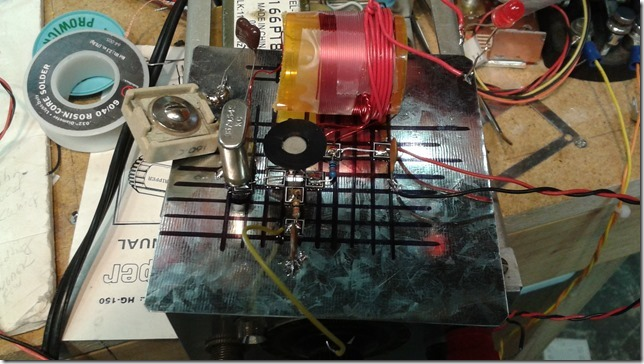 Bandpass Filter Construction by Pete Juliano (video) TFMS!!! MePads! Arduinos! 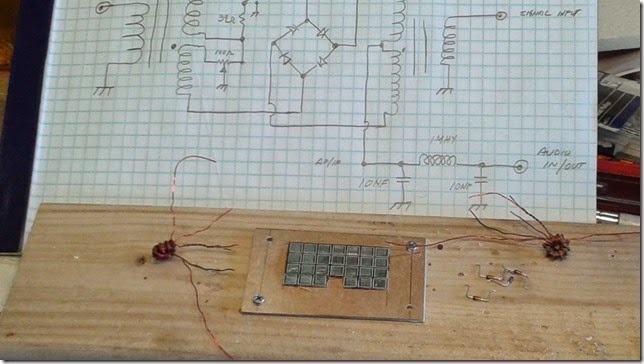 Breadboards! SuperGlue! Graph paper! Noodling! Room for Relays! Another great video from N6QW. Thunder power! Another beautiful piece of cinema from Giovanni Manzoni's Newbury Park Studios. Bravo Giovanni! Pete is obviously a doubly balanced kind of guy. 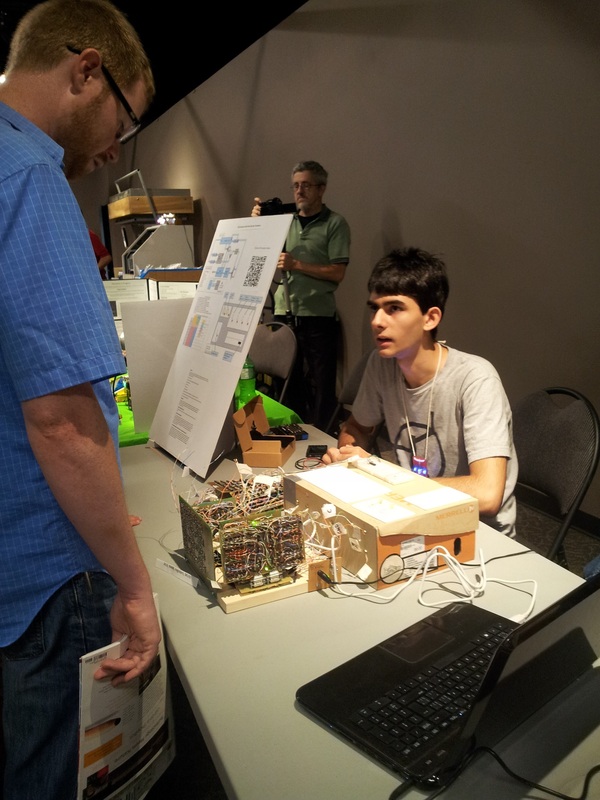 I liked his use of the W1REX MePads and the breadboard. Also, the balance pot and the un-balance switch are very handy innovations. 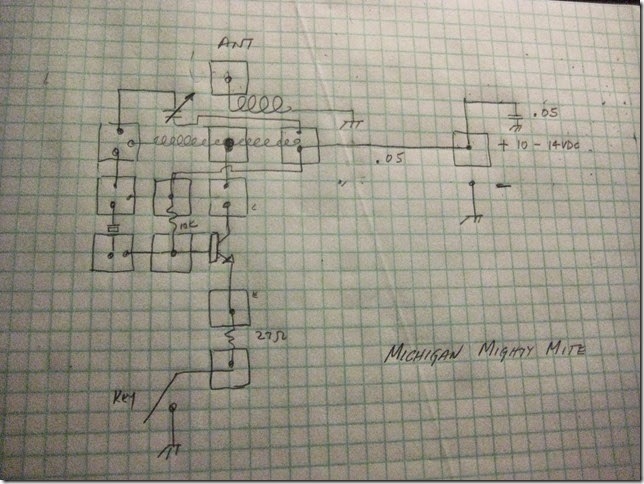 Most of all I like the way Pete's video takes you from schematic to actual circuit. Who the heck is Giovanni Manzoni? 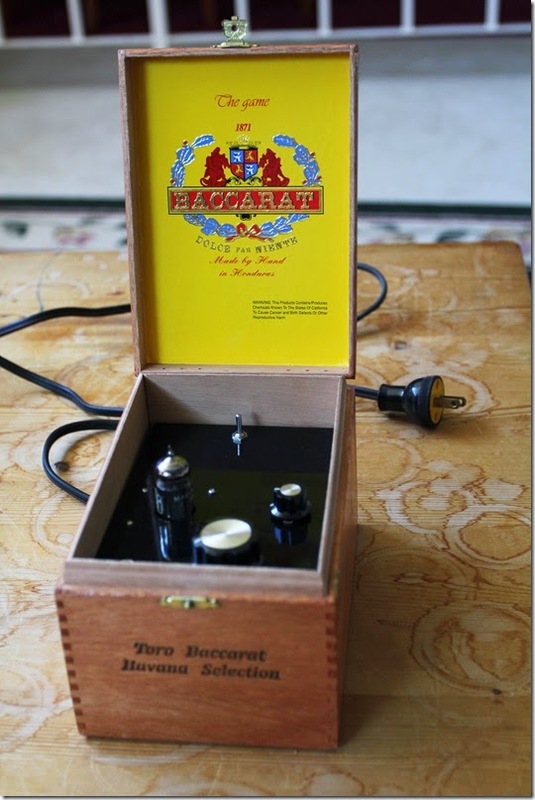 Bill's Bench Report: 140 watt Amplifier Completed! How I almost blew it up! "Nature abhors a vacuum (tube)!" "The Innovators" by Walter Isaacson. Carter, WA9DNF, REALLY knows which end of the soldering iron to grab! Meeting with Thomas, KK6AHT. The two electronic cultures. Glen Popiel, KW5GP, Author of "Arduino for Ham Radio"
Giovanni Manzoni b. circa 1950 Civatavecchia, Lazio, Italy is a noted videographer specializing in the avante garde use of YouTube in ham radio homebrew settings. Long noted for his insistence on the use of completely home-made video equipment, Manzoni went so far as to demand that his cameras and recorders only use discrete components -- he claimed that integrated circuits "freaked him out." Manzoni's collaborators have long been puzzled by his claim that all his videos are filmed "on location." What he means by this remains unclear, however, in a 1997 interview in QST-Italia, he was quoted as saying "No matter where you go, there you are!" 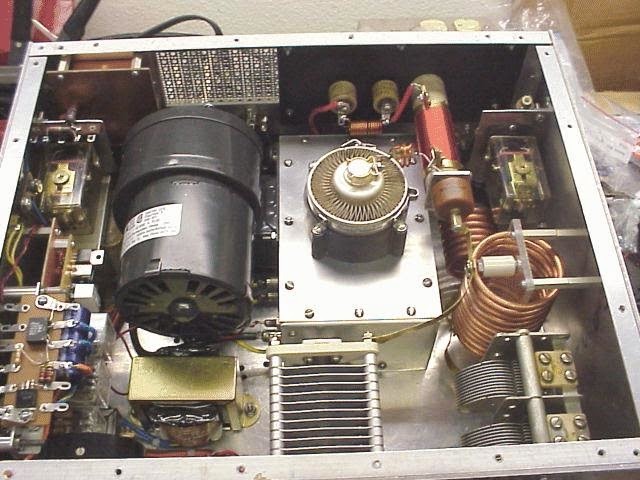 I got the Communications Concepts Inc. EB-63A amplifier working today. Yea! Kind of ironic that the highest power amp I have ever built gave me the LEAST trouble. This just goes to show that circuit layout is very important. 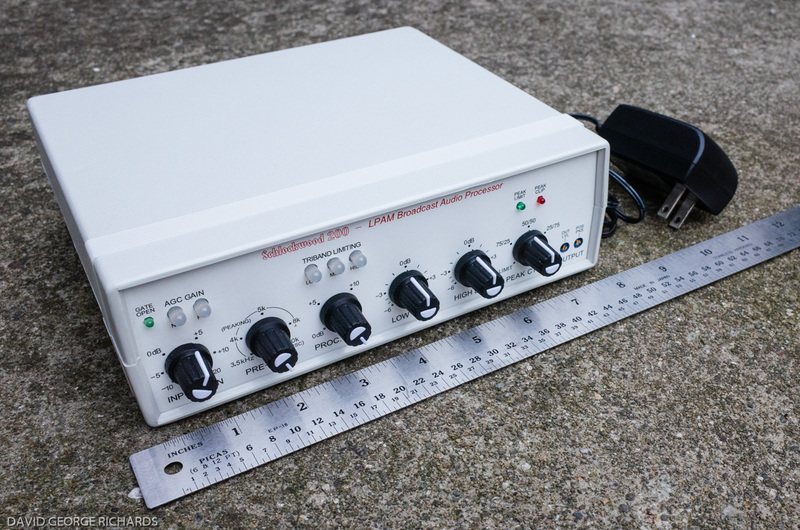 This amp is a proven design, with a proven layout and board. That's why it didn't turn into a 140 watt solid state oscillator!